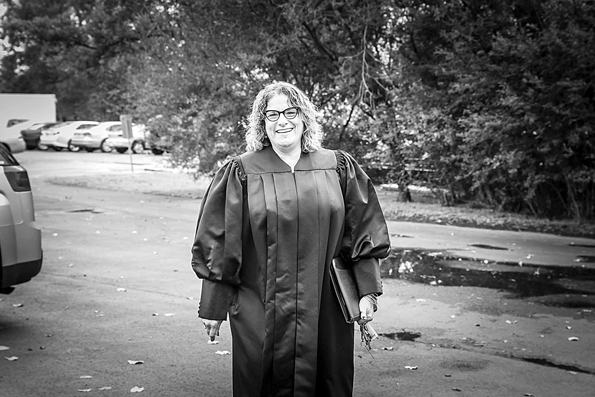 Kristen Grandinetti is a wedding officiant. Niagara Falls City Councilwoman Kristen Grandinetti has never much disguised her contempt and loathing for the Niagara Falls Reporter, its publisher, Frank Parlato, or me, who used to sweep the place out. Grandinetti seemed to argue that Sanger was just being ironic, or making a joke, and that Frank and I, being freak show knuckleheads, were simply too dense to get it. It was an interesting choice of words, because Sanger, who also published much about abortion and birth control, was also an advocate for the compulsory sterilization of ignorant people. In large part due to Sanger’s advocacy, the United States was the first country in the world to concertedly undertake compulsory sterilization programs for the purpose of eugenics. Thirty-three states ended up adopting compulsory sterilization laws, and the last forced sterilization in this country reportedly occurred in 1981. Of course, Grandinetti and Planned Parenthood no longer advocate forced sterilization. Abortion has become the population control method du jour, and the organization Sanger founded has become the largest abortion provider on earth. Just last week, Planned Parenthood became embroiled in controversy when its’ senior director of medical research. Dr. Deborah Nucatola, was caught on video tape discussing the sale of aborted human fetuses. Using an ultrasound device to better see, Nucatola told two operatives posing as buyers for a fetal tissue procurement company that Planned Parenthood’s abortion doctors routinely crushed the skulls of the unborn using forceps in order not to damage the heart, lungs and liver, which have the most monetary value. An aborted human fetus can fetch as much as $100, “depending on the market,” Nucatola said. On her Facebook page, Grandinetti has devoted no fewer than eight posts to denying Nucatola said what she said, but she said it, and you can watch the video yourself on Youtube to see for yourself. The doctor’s remarks were disturbing to the point that Planned Parenthood President Cecile Richards was moved to apologize on behalf of the organization. But an interesting question remains. Sanger, in her advocacy for forced sterilization, stated that government officials be charged with deciding exactly who was desirable and who was undesirable enough to undergo the irreversible sterilization procedure. Since Grandinetti is a government official who has publicly referred to Parlato and myself as “ignorant” and “freak show knuckleheads,” we can’t help but wonder whether the councilwoman thinks Niagara Falls wouldn’t be a better place had we been aborted. Our organs could have been harvested for use in supporters of Niagara Falls Mayor Paul Dyster, Planned Parenthood would have made a couple of hundred bucks and the city’s much reviled newspaper of record for the past 15 years just wouldn’t exist. For Grandinetti, that sounds like a win-win-win.